Wonderful sights and experiences are plentiful in the great land of Russia. Russia is the world’s largest nation, by land mass, and is a great place to plan a vacation, should you be so lucky to do so. If you ever plan on visiting Russia or one of its many great cities such as Moscow or Saint Petersburg, one of the first things you should try is the food! Russia is full of delicious cuisine that is sure to delight your family during any meal. If you’re not traveling to Russia and simply want to cook up a tasty Russian meal, check out these five dishes below! 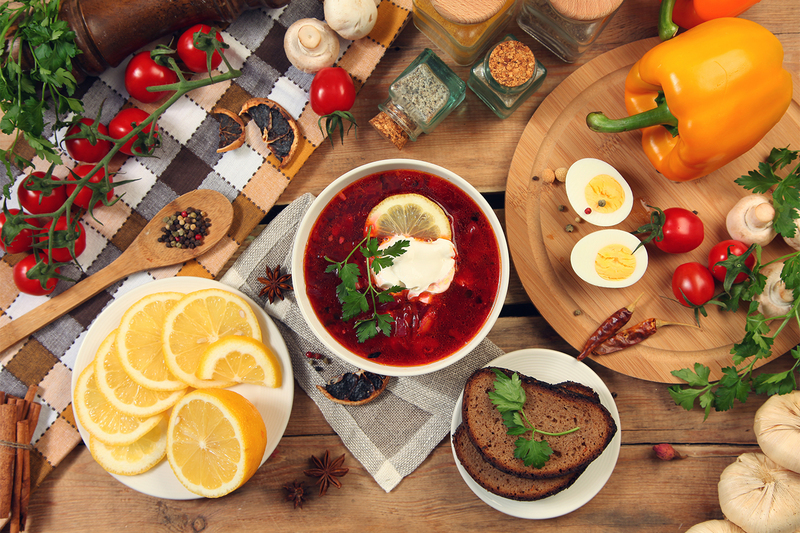 One of the most famous dishes in all of Russia is Borscht. Russia is known for its cold weather and nothing will warm you up quite like this soup. The dish is primarily made with vegetables, sour cream and beets, which give the dish its signature red color. Whether it’s an appetizer or a full meal, you can enjoy it so many ways, even cold! Many of the locals have different variations on this dish so don’t be afraid to try a bunch of different recipes if you can. Whether in the morning or for dessert, you can enjoy these cheesy delights at any time of day. Syrniki is a kind of cheese pancake made with cottage cheese, eggs, sugar and flour. The name syrniki is derived from the Russian word сыр, which means “cheese.” Garnish these delicious delight with some jam or honey for some added flavor! Popular in Slavic countries, these filled dumplings are quite a tasty treat. These appetizers are made by wrapping pockets of dough around a filling such as meat, potatoes, cheese or mushrooms. Serve these pierogies with a side of sour cream or bacon and your family will be lining up for seconds. Prounounced “go-loob-stee,” this dish is sure to be one of the best-stuffed cabbage rolls you’ve ever had. All you need is some cabbage, white rice, carrots, eggs, butter, sour cream and some ground meat. After it’s been topped with some tomato sauce, you’ll be enjoying one of the most common dishes found in any Russian cookbook. Kasha is one healthy recipe from Russia that is a common treat to enjoy during the harsh winters. This porridge is made with buckwheat, which Russia is one of the highest producers of. This nutritious meal combines mushrooms, butter, onions and meat for a meal that’s easy to make and enjoy! This is just a small sample of the many delicious dishes from the country of Russia. If you’re traveling to this great nation or just want to cook up something from the culture, try one of these five recipes above. It’s great to experience new flavors and recipes every now and then, and Russia is full of treats to try. You never know – one of these dishes just might be your new favorite!